Sellafield is a nuclear fuel re-processing and nuclear de-commissioning site, close to the village of Seascale, in Cumbria. It is in a remote coastal area between the Irish Sea and the mountains of the Lake District. It started life as a Royal Ordnance Factory during the Second World War (1942), as Sellafield in 1947, associated with names like THORP (Thermal Oxide Reprocessing Plant), Calder Hall and Windscale. It is the site of the world's first commercial nuclear power station to generate electricity on an industrial scale. This, the most notorious nuclear facility in the UK, is the last place on earth that I would have expected to find a celebration of unique wall art in the form of a national art exhibition. ‘The Art of Reprocessing’, at the Beacon Museum Whitehaven, tells the story of Sellafield’s Thermal Oxide Reprocessing Plant (Thorp). It is commissioned by the site’s operator Sellafield Ltd, and features work from local, national, and international artists. The exhibition opened on November 17th 2018, at the Beacon Museum in Whitehaven. The Art of Reprocessing opened with a VIP preview event and was open to the public until early January 2019. A smaller version of the exhibition will stay open until March 2019. This nuclear art includes sculptures, relief printing, collages, textural canvases, paintings, and sketches. Each piece has been individually commissioned to convey a moment in the life of the plant. Katie Edwards, Helaina Sharpley, Kathy Harris, Paul Leith, Heidi Hodkinson, Sarah Strachan, Jill Davis, Debby Akam, Simon Wilson, Chiyun Yeh, Marion Kuit, Issie Holmes, Thomas Hedger, Veronica Currie, Kate Eveson, Aimee Green, Sarah Taylor, Hollie Morton-O’fee, Olivia Pilling and Charlotte Ellis. 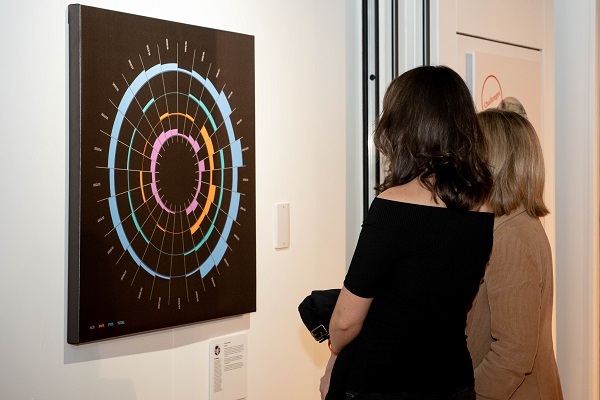 The ‘Art of Reprocessing’ nuclear art exhibition marks the end of an era at Sellafield. Sellafield is quite an old industrial site, exhibiting all the traits, colours and materials that display and celebrate its heritage. Brilliant Wall Art replicates this impressionism in the industrial furniture that it sells online. Brilliant Wall Art is the Midlands premier wall art, home and garden accessory specialist. Based in Birmingham, Brilliant Wall Art have been providing decorative metal wall art and home accessories for over ten years. 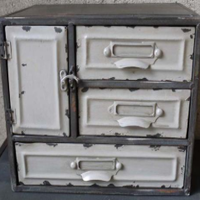 This industrial metal cabinet 8 drawers is a really useful freestanding storage unit. The dimensions of the cabinet are approximately 59.5cm (23.5") high x 31cm (12.25") wide x 18.5cm (7.25") deep. Its drawers measure approximately 12cm (4.75") high x 14cm (5.5") wide x 18cm (7") deep. The retro vintage aeroplane wall shelf is made from metal and reclaimed wood. It has a distressed aged vintage finish to add charm and character to the design. It measures approximately 34cm (13.5") high x 60cm (23.5") wide x 28cm (11") deep. What a fabulous vintage industrial stool, with a cast iron metal base, this is. The seat is constructed from reclaimed timber and has a distressed vintage industrial finish. This will be a great addition to any kitchen, home, bar or garden. It measures approximately 70cm (27.5") high x 45cm (17.75") wide x 35cm (13.5") deep. The stool winds up to approximately 79cm (31"). Why not visit Brilliant Wall Art at the Worcester City Centre market every Saturday? You will be able to view and examine the quality wall art, garden accessories and home décor on display.